Madame Tussauds is currently (as of April 2018) host to a unique attraction set in the Alien universe. Titled Alien: Escape, it is a combination live-action and model exhibition based on 2017’s Alien: Covenant. 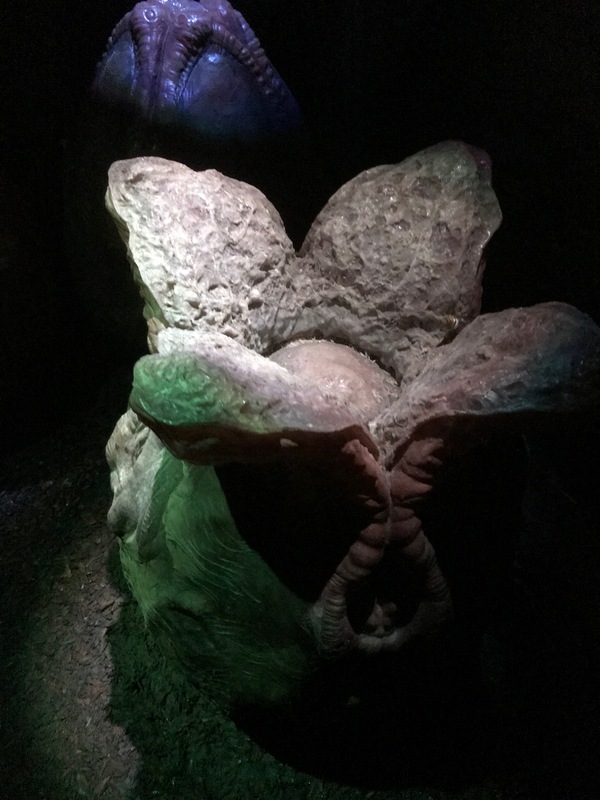 Alien: Escape opened last year, and harks back to the fondly remembered Alien: War (which ran in Leicester Square’s Trocadero Centre, but has unfortunately been closed for many years). Notwithstanding my very lukewarm reaction to Alien: Covenant (which I think is probably the weakest ever entry into the Alien series – check out my review here), I knew that I had to visit Alien: Escape. First things first: never – and I repeat never – visit Madame Tussauds over a holiday period. That is, unless you like queuing for hours in the rain over an Easter weekend. The cost of the exhibit is also worthy of note. It is not included with the main ticket price. It’s only a few pounds extra (£5.50 at the time of writing), but that’s on top of the £35 main attraction price. In Alien: Escape, you are colonists aboard a starship, awoken from hypersleep a year early. The ship is infested with aliens, and you’re trying to escape. A tour guide/fellow traveller accompanies you through some exhibition rooms, which include a med-bay with a very gross “back-burster” victim, and some starship corridors. A combination of live action and video monitors shows how other colonists meet their demise, and the scene is set with strobe lighting and other effects. The set dressing is very nice, and all of the performances (live and recorded) are well done. The waxwork effects – as you’d expect – are great; the alien eggs in particular were very well done. It’s not until the final scene (or corridor!) that we get to see the actual xenomorph. Carefully lit, and with sound effects, it certainly doesn’t disappoint. But don’t expect to take any snaps of our camera-shy friend, because as soon as you find the alien you’re basically done with the ride. In an ending very similar to Alien: War, you end up running out of the corridor and right into the rest of Madam Tussauds. Overall, Alien: Escape is very well done, but far too short. It shouldn’t be an extra cost. However, if you’re a dedicated alien fan, then I doubt you will want to pass up on this opportunity.